The magazine Starlog came along when fans of sci-fi movies and TV shows were split into two camps: those still trying to figure out whether or not Stanley Kubrick’s 2001: A Space Odyssey was actually any good, and Star Trek fans still waiting for Paramount to revive what was not yet “the franchise.” Star Wars was just about to hit and bust open the genre’s wallet. If you’ve been living on Io for the past few days, you might not have heard that the print version of Starlog is no more. Like so many other magazines, it has ceased to be and is moving to the internets, temporarily they say, though permanently is more like it. It’s a tough climate for print, though I hear trees have never been happier. we’re not really friends in the “let’s have a beer” sense since we’ve never met, but we do exchange the odd bit of communication now and then. He may not remember, but he, “Kim” Howard Johnson and I “met” through Monty Python fandom back in the Stone Age, and I once wrote a Python-inspired skit for McDonnell’s college variety show (a skit I wish I still had a copy of, though I can remember it in great detail). The Starlog media empire at its peak also used to publish a magazine called Comics Scene, which was for a time edited by another acquaintance of mine, Bob Greenberger. Comics Scene once ran a very generous article on a comic book I had created called Dinosaurs For Hire back in the 1990s. The article was written by Scott Lobdell. 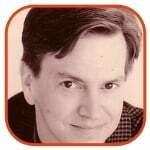 I’ve also crossed paths many times in the past with other Starlog editors like Marc Bernardin and Maureen McTigue. Have I met my name-dropping quota yet? Starlog, the magazine, was an invaluable part of my sci-fi experience, never hyper-serious and certainly not snarky about its subjects. The magazine had a knack for landing fascinating interviews and features (on sci-fi old and new), running lots of great photos as well as a book review section and some very funny cartoons. 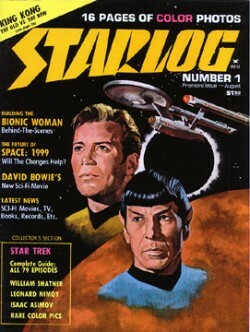 For a lover of Twilight Zone, Star Trek, Star Wars and Planet of the Apes, Starlog was a goldmine, a pre-Google oasis of sci-fi history. I also looked forward to editor McDonnell’s first-person editorials that always had a great deal of wit and charm. I, of course, am part of the problem. By my professional industry cred, I’ve gotten the magazine comped to me for years (I was surprised to discover that its actual newsstand cover price was $7.99 an issue), so I never actually contributed to the health of the magazine I shall now miss. Fortunately, they do have an active website that they’re updating with new stuff (like Alan Dart’s review of Krod Mandoon And The Flaming Sword of Fire). I hope they’ll start archiving their old content – they have 33 years of fanboy gold in those files. John Zipperer’s excellent blog (Weimar World) has the news here and a round-up of internet reactions here.